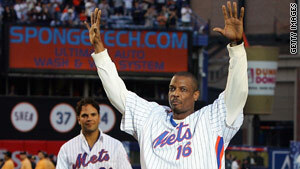 Police in Franklin Lakes, New Jersey, say Dwight Gooden was arrested after a crash about 8:50 a.m. ET Tuesday. (CNN) -- Former New York Mets pitcher Dwight Gooden was driving under the influence of drugs with a child in the car when he was arrested Tuesday after a car crash, police said Wednesday. Gooden was arrested after the two-vehicle crash about 8:50 a.m. ET Tuesday, police in Franklin Lakes, New Jersey, said in a statement. Gooden, 45, lives in Franklin Lakes, authorities said. Detective Lt. John Bakelaar told CNN that the child in the car was Gooden's 5-year-old son. Gooden faces charges including endangering the welfare of a child, driving under the influence of drugs, DWI with a child passenger, leaving the scene of a motor vehicle accident and reckless driving, the statement said. He was released on his own recognizance. Gooden pitched for the Mets from 1984 to 1994, winning the 1985 Cy Young Award after a 24-4 record that year. He also pitched for the New York Yankees, the Cleveland Indians, the Houston Astros and the Tampa Bay Devil Rays before retiring from baseball after the 2000 season. In a November article in the New York Daily News, Gooden discussed his long struggle with drug abuse, which included prison time in 2006. "I'm not out to prove everybody wrong," he told the Daily News. "I'm taking it day by day. I'm clean and sober and just trying to make good choices for me and my family." CNN's Meg Miller contributed to this report.